Computer Space was the first video game product released to the general public, but it was not the first one to be conceived or designed. In 1966, an unassuming, taciturn engineer named Ralph Baer working for a large defense contractor became the somewhat improbable “father of video games” when he decided to do something about his long-standing disdain for broadcast entertainment by designing an interactive game playable on a television. Like Bushnell and Dabney four years later, Baer decided to create a spot-generating system that could place and move dots on the screen through use of a video signal. It is from this video signal — a distinct technology from the vector monitor hardware that powered Spacewar! — that the term video game derives, making Baer the first person to ever design one according to the original technical definition of the medium. Unlike the story of Atari, which has to be cobbled together largely from (wildly divergent) personal recollections and the occasional deposition, the story of Ralph Baer and his brown box derives largely from the actual documents of the period, carefully preserved by Baer and made available to the general public in a variety of locations. Thus, we have a greater understanding of the birth of the first home video game console than we do on any other topic in early video game history. Little controversy therefore exists around the development of the Magnavox Odyssey, though the occasional fact has been confused or distorted over time, which will be covered in the following posts. Rudolf Heinrich “Ralph” Baer was born on March 8, 1922, in Pirmasens, Germany. According to an oral history with Baer conducted by the Computer History Museum, his father, a Jewish World War I veteran named Leo, ran a leather tannery supplying the many shoe factories in town. Due to the depressed economic conditions in the region after World War I, the family moved to Cologne in 1924. As a German of Jewish descent, Baer was subjected to increasingly anti-semitic practices after Adolph Hitler came to power and was expelled from school at the age of 14. Baer then attempted to secure a job as a plumber’s apprentice, but was not “Aryan enough” for his potential employer. According to an interview conducted by Tirstan Donovan for his book, Replay, Baer ended up working in an office instead, learning shorthand and typing and performing filing and bookkeeping tasks. In 1938, when Baer was 16, his family emigrated to the United States just ahead of Krystallnacht. According to the Donovan interview, the quota for Jews immigrating to the United States was very small, but his mother, Lotte, had a large number of relatives in New York, and Baer spoke decent English, enabling him to have a direct conversation with the American Consul in Stuttgart. Baer believes these factors played a decisive role in allowing his family to escape Nazi persecution. According to Harold Goldberg in his book All Your Base Are Belong to Us, the Baer family settled into an apartment building near the Bronx Zoo, and Baer went to work in a factory owned by a cousin where he earned $12 a week putting buttons on cosmetic cases until he saw an ad on the back of a magazine for the National Radio Institute and enrolled in a correspondence course in radio servicing. Per his oral history, upon completing the course Baer took a job with a radio store on Lexington Avenue handling all pickup, delivery, and servicing for the company. In 1943, Baer was drafted into the United States Army. Despite his radio background, Baer was assigned not to the Signal Corps, but to the combat engineers. After training at Fort Dix in everything from bridge building to landmine disarmament, Baer transferred to Camp Ritchie, Maryland, to train in interrogation techniques because of his German language fluency. Shipped overseas as part of the buildup for the Normandy landings, Baer contracted pneumonia in England and was spared going ashore on D-Day. Afterwards, Baer became part of a special military intelligence unit attached to Supreme Allied Commander Dwight Eisenhower’s headquarters that gave courses in identifying enemy uniforms, interrogating enemy soldiers, and identifying and handling enemy weapons. In March 1946, Ralph Baer received his discharge from the Army and returned to New York, where he secured a job fixing faulty radios for a manufacturer called Emerson. Bored after three months, Baer quit and explored avenues for continuing his education. Turned down by all the New York colleges because he had no records of his education in Germany, Baer saw an ad for a small unaccredited school in Chicago called the American Television Institute of Technology (ATIT), where he enrolled in late 1946 through the GI Bill. By the time he graduated in 1949, the school had received accreditation, so Baer walked away with one of the very first BS degrees in television engineering. Upon graduating from ATIT, Baer secured employment at a small medical equipment firm called Wappler Inc., where he built surgical cutting machines, muscle-toning pulse generators, and similar equipment. Feeling the work lacked sufficient challenge, however, Baer departed two years later to take a job at Loral Corporation, a defense contractor formed in 1948 by the combination of two businesses that shared the same building, a machine shop run by William Lorenz and an amplifier maker run by Leon Alpert. In 1951, Loral chief engineer Sam Lackoff decided the company should build a high class television set, so he hired Baer and another man named Leo Beiser to build it. This job would provide Baer his first brush with video games. While several CRT computer games were developed in the 1950s simulating everything from tic-tac-toe to pool to tennis, no one had ever thought to try and replicate this feat on a standard television set for the very simple reason that doing so would require bulky and expensive electronic components that could not be scaled down for a consumer product. 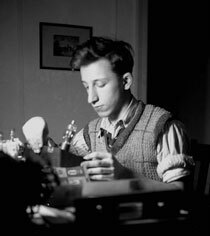 The closest anyone came to trying in the period occurred in 1947 when Thomas Goldsmith and Estle Ray Mann submitted a patent for a “Cathode-Ray Tube Amusement Device.” According to his New York Times obituary, Thomas Toliver Goldsmith was born in 1910 in Greenville, South Carolina, and began building crystal radio sets as a teenager. After graduating from Furman University in 1931, Goldsmith matriculated to Cornell University, where he earned his Ph.D. in 1936. As part of his dissertation research, Goldsmith required an oscilloscope, so he contacted one of the leaders in the field, Dr. Allen DuMont, a brilliant inventor who had developed a long-lasting CRT crucial to the development of the first practical television sets and established DuMont Laboratories around this invention in 1931. After earning his degree, Goldsmith joined DuMont as research director, a post he held until 1965. At DuMont, Goldsmith became an expert on CRT displays through radar work during World War II. Meanwhile, DuMont Laboratories became heavily involved in the television business and even started one of the first television networks, the DuMont Television Network, in 1946. 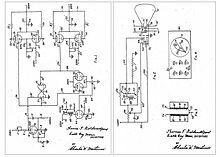 It was in this climate that Goldsmith and Mann developed and patented their simple game, which consisted of a few resistors, a sawtooth wave generator, and a CRT. According to the patent, the game simulated firing a missile at a target, perhaps taking inspiration from Goldsmith’s radar research during the war. Using a knob, the player would be able to guide the electron beam generated by the CRT across a screen to a target. After a certain period of time passed, which was adjustable by the player, the beam would defocus to simulate an explosion. If the beam defocused while on the target, it counted as a hit. Despite filing the patent, however, DuMont never actually built the game. The reason for this is not clear, though Goldsmith’s obituary points out that DuMont was always strapped for cash during this period, so the company may have simply not had the resources to invest in a new commercial product. Some have been tempted to label this Cathode-ray Tube Amusement Device as the first video game, but the device fits no definition of the term. There is no video signal, no computer, no software program, and only the simplest of electronics. There are also no graphics, as the targets for the system consist of physical objects affixed to a screen. Basically, the exact same effect could have been created by mechanically controlling a flashlight shining its beam on a piece of paper. The device does deserve recognition, however, as the first attempt to create a game incorporating a CRT. From available evidence, no one else thought to adapt television technology into a game until Ralph Baer in 1951. Royden Coe Sanders, Jr. was born in Camden, New Jersey, in 1917. According to a 1958 profile in the Microwave Journal, while a junior at the Rensselaer Polytechnic Institute the engineering genius formulated a theory for a radio altimeter that could bounce FM waves off objects to determine the altitude of an aircraft. Told by his instructors that this was too complicated a project for a student, Sanders retreated to his backyard in Audobon, New Jersey, to build it himself. After the Navy showed some interest but refused to entrust such an undertaking to someone so young, one of his instructors, Dr. Irving Wolfe, suggested he approach RCA. Reluctant to turn over his work to a large corporation at first, Sanders finally joined the company when he became concerned that Bell Telephone might develop an FM altimeter before he could do so on his own. The result was the AN/APN-1 altimeter patented in 1940, a staple of U.S. and British military aircraft during World War II. After the war, Sanders left RCA for Raytheon, where he oversaw the Radar and Missile Division, informally known as “Lab 16.” In this role, Sanders took over development of the Lark guided missile program, which had been started at Fairchild Aircraft in 1945, but had so far been unsuccessful. Lab 16 developed a new guidance system for the Lark and performed the first successful aircraft interception by a surface-to-air missile in January 1950. Sanders subsequently oversaw the beginning of the Sparrow-III and Hawk guided missile programs before a desire for independence led him to recruit ten of his fellow engineers in 1951 to join him at a new firm called Sanders Associates. Briefly located in Waltham, Massachusettes, Sanders Associates settled into an old textile mill in Nashua, New Hampshire, in 1952, where it proceeded to grow into a Fortune 500 company and the largest employer in the state. According to Sanders’ obituary in the Nashua Telegraph, one of the company’s first projects was a miniature gyroscope marketed by Timex, and it also joined the “Tinkertoy” project that represented one of several attempts to create interchangeable electronic components before the advent of the integrated circuit. 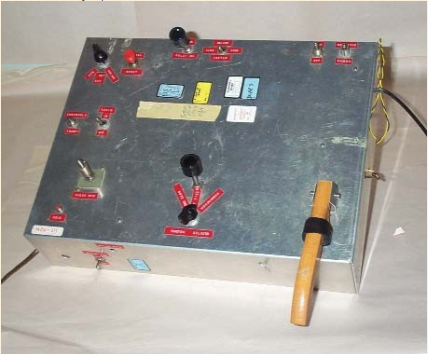 The company’s most important contributions were in electronic warfare, however, where it deployed the first viable electronic countermeasure system. According to the Microwave Journal, by the time Baer joined Sanders in 1958, the company employed 8,000 people and brought in sales of approximately $9 million a year. According to Baer’s oral history, Sanders assigned him to its Equipment Design Division, where he worked primarily on a spying apparatus codenamed BRANDY designed to pickup Soviet radio transmissions in Berlin. Soon after Baer completed the project ahead of schedule, the Equipment Design Division manager retired, so in 1966 Baer was promoted to lead the unit. It was in this context that Baer found himself sitting outside a New York City bus terminal on August 31, 1966, waiting for a colleague to arrive so they could go to a meeting together. For reasons that have never been fully clear to Baer himself, in that moment he found himself once again thinking about how a person might interact with a television set. The next day, he wrote a four page proposal, which has been preserved by the Smithsonian and is viewable in full in Baer’s autobiographical work, Videogames: In the Beginning, for a “TV Gaming Display” that would transmit a video signal to a television through its antenna ports and incorporate an RF modulator oscillating at one of the standard TV channel frequencies so that the television could tune to the signal and display the game. Baer labelled this signal Channel LP (for “Let’s Play”) and proceeded to outline several types of games he felt would be well suited for his system such as driving games with a steering wheel controller, card games, board games like checkers and chess, basic educational software like arithmetic and geometry programs, games of chance like dice and roulette, target shooting games, and a “pumping” game in which each player presses a button rapidly to fill a vessel. On September 6, Baer drew up a rough schematic of what such a device might look like and specified channels 3 and 4 for the device’s video signal, which remained the standard right up until plugging a video game console into a television no longer required an RF modulator in the 1990s. Soon after drafting these documents, Baer initiated a skunk works project to build a prototype of his new game system. As Baer explained to Kent in The Ultimate History of Video Games, the Equipment Design Division had a staff of 500 people, so no one would notice or even care if Baer took an engineer or two aside and put them to work on a special project in between more important work. Therefore, as Baer recounted in his book and his oral history he asked one of his department managers to lend him a technician to create a feasibility prototype of his TV game using vacuum tubes. The manager loaned him a man named Bob Tremblay, who created the circuitry necessary to interface a Heathkit TV alignment generator with a television via an RF modulator and move a simple vertical line around the screen. Completed in December 1966 and retroactively identified as TV Game #1 by Baer, this simple setup was, in a way, the first video game system. Like Baer’s initial proposal, this system is preserved at the Smithsonian. Now confident that his game idea had merit, Baer approached the Sanders Corporate Director of Research & Development, Herbert Campman, to officially sanction the project. After viewing Baer’s simple line-moving system in action, Campman approved further development with a modest initial budget of $2,000 for labor and $500 for materials. Sanders was now officially in the video game business. Baer continued to brainstorm game ideas with a fellow engineer named Bob Solomon in December 1966 and January 1967, but his game project did not really start in earnest until February 12, 1967, when he brought a new technician on board named Bill Harrison. Born in Sagamore, Massachusettes, in 1935, William L. Harrison left home in 1953 at the age of eighteen to join the United States Air Force. According to an interview conducted by Benj Edwards, after completing basic training, Harrison was assigned to an electronics course at Kessler Field in Mississippi so he could be trained as a ground radar repairman. After completing his tour of duty in 1957, Harrison joined Sanders Associates, where his cousin was married to one of the founders, and by 1967 he was part of the Ocean Systems Division working on a sonar buoy project. According to Harrison, Baer called one day to ask him to come over and see his TV game prototype before asking him to join the project. According to Baer’s book, he was interested in recruiting Harrison, whom Baer knew because the engineer had been assigned to the BRANDY project for about a week, because he was known to be reliable and also had some television experience from tinkering with sets in his spare time. Harrison said yes, and work soon commenced on the first real system prototype. According to Baer’s book, he stashed Harrison in a small room on the fifth floor of the main Sanders building on Canal Street and told him to keep their project a secret. The door remained locked at all times, and only Baer and Harrison had a key. Baer gave him a few initial schematics, including a design for a light pen for use with a quiz game in which the player had to point the gun at the correct answer on the TV screen, as well as a 19-inch RCA television he had acquired specifically for the project. Unfortunately, work on the TV game progressed only intermittently because whenever Harrison was needed elsewhere for more important work, Baer would have to let him go, often for weeks at a time. Indeed, Harrison had barely started development when he had to leave the project for three months. During this lull, Baer brainstormed more game ideas with another engineer named Bill Rusch, an MIT graduate known for being highly creative, but very difficult to motivate. On May 10, 1967, Rusch drafted a formal memo articulating multiple game types that emerged from these brainstorming sessions, including a drawing game, two driving games (driving along an endless road or a circular track), a chase game, a maze game, a roulette game, several variations on a baseball guessing game (divide the screen into horizontal bands and have the “batter” guess in which band the “pitcher” will throw the ball), a U.S. geography map game, two target shooting games, a number guessing game, a “fox and hounds” game (a chase game where multiple pursuers chase one target), a soccer game, a golf putting game, and a horse racing game. Meanwhile, Harrison returned to the project on May 2 and began to modify TV Game #1. He added color to the system and implemented the very first completed game, the pumping game outlined in Baer’s first memo. In what was most likely the first video game ever made (by the technical definition), one player would furiously press a button to raise a blue square on the screen that represented water, while the other player would pound his button to lower the square. An overlay placed on top of the screen contained a drawing of the “bucket” that held the “water.” If the first player could fill the bucket high enough within a time limit, he won, otherwise, the water turned red and the other player won the contest. Subsequently, Baer directed Harrison to implement four additional games, all of which required only one spot, which was all the hardware could produce. These were a second pumping game called “Firefighters,” a one-player variant of the original pumping game in which the player pressed a button to reduce the size of the dot to simulate fighting a fire, “Color Catching,” which was a guessing game, “Roulette,” which simulated the popular casino attraction, and “Car Ride,” in which the dot represented a car that the player had to drive down a road. 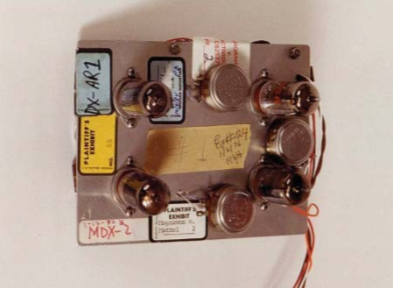 Once these were completed, Harrison built a few more components that allowed the team to ditch the Heathkit equipment altogether; this became TV Game #2. One June 14, 1967, Baer invited Campman back to the lab for a demonstration of TV Game #2. (Note: In Replay, Donovan conflates this meeting with the initial funding meeting at the end of 1966. Once again, Baer’s book is the best source for the sequence of events.) Though impressed by all the games, Campman particularly liked the light gun game and believed that Baer now had a winning product. Campman approved additional R&D funding and indicated it was now time to bring senior management into the loop. The very next day, Baer demoed the system for Royden Sanders, executive VP Harold Pope, and the entire board of directors of the company, who happened to be in town for a meeting. Seven games were demoed: “Chess,” which was actually a chase game in which each player moved a dot one space at a time around a chess board overlay trying to trap his opponent, “Steeple Chase,” a free-form chase game, “Fox and Hounds,” a chase game making use of the random dot hardware to place multiple pursuers on the screen, “Target Shooting” with the light gun, “Color Wheel Game,” a guessing game in which the dot cycles through a series of colors and the players must guess which color will appear, and the two previously described pumping games, which were named “Bucket Filling Game” and “Pumping Game” for this demonstration. According to Baer’s interview with Donovan, neither Sanders nor Pope were particularly impressed, nor were all but two of the company directors. Nevertheless, as Baer describes in his book, when the demonstration ended, Sanders and Pope conferred briefly before formally authorizing the project with the goal of creating a commercial product that Sanders could sell itself or license to another company. It looked like the commercial video game would soon become a reality.